The Vice-Chancellor of the University of Ilorin, Prof. Sulyman Age Abdulkareem, has canvassed inclusive education, saying it is the only way to achieve sustainable development. 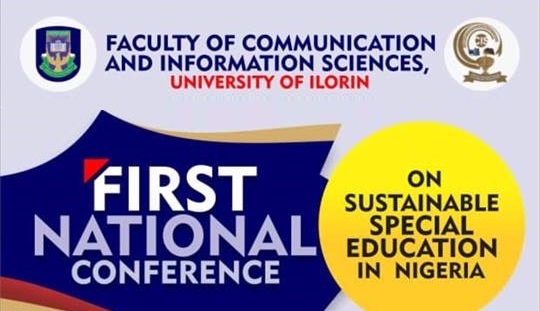 Prof. Abdulkareem, who stated this last Tuesday (January 29, 2018), at the First National Conference on sustainable special education in Nigeria organised by the Faculty of Communication and Information Sciences, University of Ilorin, said there should be no barrier to education. Represented by the Deputy Vice-Chancellor (Research, Technology and Innovations), Prof. Mikhail Buhari, at the Conference themed “Information and Communication Technology: Drivers of Sustainable Special Education”, the Vice-Chancellor stressed that the nation's major investment must be in education for all. Prof. Abdulkareem noted that access to education in Nigeria is clearly a major problem that requires urgent attention, stressing that it manifests in the yearly increase in the rate of drop-outs in schools. Warning that if the 13.2 million Nigerian children who are out of school are not helped, they would eventually constitute a challenge to national development, the Vice-Chancellor said, “This becomes more frightening and distressing when we examine the high proportion of the figures that are denied access to education because they are physically challenged”. He called for a more creative and innovative way of opening and expanding access to education through technologies, saying that he hoped the conference would throw light on how to achieve inclusive education. Prof. Abdulkareem commended the Dean of the Faculty of Communication and Information Sciences, Dr. Rasheed Gbenga Jimoh, for the dynamism and innovativeness with which he has been steering the ship of the Faculty in the last two years of his tenure. He said, “I must say openly that the University has not got any cause to regret giving the mantle of leadership to a young academic like Dr. Jimoh. Rather, he has proved and established that our youths are indeed potential drivers of national development that has been long elusive to us in Nigeria”. The Vice–Chancellor acknowledged the effort of the Director General of NITDA, Dr. Isa Ibrahim Pantami, for choosing the University of Ilorin for the programme. He also appreciated the Chief of Staff to the Oyo State Governor, Dr. Gbade Ojo, for sending a powerful delegation to the event despite the tight schedules of his office. On his part, the Dean, Faculty of Communication and Information Science, Dr. R .G. Jimoh, observed that access to education by the physically challenged individuals, all over the world, requires extra commitment by the stakeholders. He called for major investments in the education sector through technology. In his remarks, Dr Ojo, who was represented by Dr. Fatai Aremu of the Department of Political Science, said that the responsibilities of people with disabilities education should not be limited to individual, but rather be the responsibilities of all to give them access to education like others. Also speaking at the event, the Registrar/Chief Executive, Joint Admissions and Matriculation Board, (JAMB), Prof. Is-haq Oloyede, who was represented by the Board’s Director of Psychometrics, said that he was always passionate about the interest of people with disabilities, particularly when it comes to competitive examinations. The JAMB Chief Executive added that the Board conducts matriculation examination for all candidates seeking admission into various institutions of higher learning in Nigeria, noting that the Board is working to ensure that physically challenged candidates, who passed their examinations, secure admission into the institutions of their choice. The United Nations Project Manager, Lidwen Meffo, who was the Lead Paper Presenter, said that the power of technology has gone beyond imagination, which enables us to know what is happening around the world instantly. In her remarks, the Director, Centre for Supportive Services for Deaf, University of Ilorin, Dr. P. O. Etejere, who was represented by Mr. Isarinade Julius Olaolu, said that emphasis on the awareness of the physically challenged people should be spread to grassroots. The Principal, Kwara State School for Special Need, Ilorin, Hajia Aroyehun Fausat Oladunni, expressed her gratitude to the state government for its constant support to the school. She pleaded with parents to purchase required materials for physically challenged students to equip them for total education. He described the conference as a historic one not, just for the Faculty but the University as a whole. Among those that attended the event were the Registrar, University of Ilorin, Dr. (Mrs) Folaranmi Modupe Olowoleni, who was represented by the Deputy Registrar, Human Resources, Mrs R. A. Okojie; the University Librarian; Prof. Abdulwahab O. Issa; the Dean, Faculty of Pharmaceutical Sciences, Dr. (Mrs) R. O. Ayaniyi; the Head, Department of Mass Communication, Dr. Lukman A. Azeez; and the Head, Department of Library and Information Science, Dr. K. T. Omopupa.